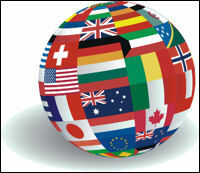 Globalisation affects the world on several levels. Students should avoid using this term as a catch-all term and rather show how the different aspects of society is affected by it. (of course, with relevance to the question) This leads to a clearer and more focused essay that demonstrates good understanding of this key term. An article will supplement this discussion. One point of discussion in this area is whether globalisation has lessened the importance of national boundaries and government. This is especially the case for small free-market economies (i.e Singapore) who arguably have no choice but to respond to global pressures (both politically and economically). Essentially, can we . . .
1. The revolution in transport and communication has ‘shrunk’ the world and increased the permeability of borders. 2. News modes of governance ranging from transnational organisations to multi-lateral institutions (think UN, EU, World Bank, IMF etc) are supplanting national lawmakers. Some argue that domestic policymakers are largely powerless in the face of global markets. 1. (first example) The global financial crisis has shattered this myth. Most banks . . . They feel that if you do away with all these regulations . . .